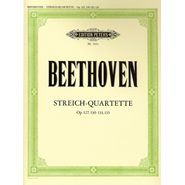 String Quartet. 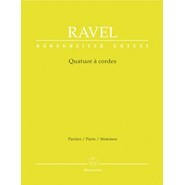 Composed by Maurice Ravel (1875-1937). Edited by Juliette Appold. 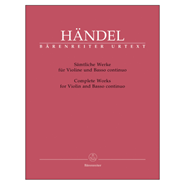 Urtext Edition. Set of parts. 15/14/16/11 pages pages. 31 x 24.3 cm inches. 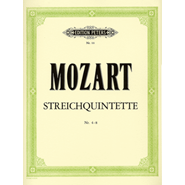 Published by Baerenreiter Verlag. Maurice Ravel's sole composition for string quartet dating from 1903 is considered today to be one of the most important, most performed and recorded works of chamber music repertoire.The editor, Juliette Appold, traces the work's inception and documents its first performance and the reactions to it from none other than Faure and Debussy. 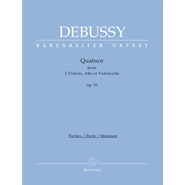 Also addressed are later performances of the work under the supervision of Ravel, the early recordings made under Ravel's auspices and the first publication by Astruc. 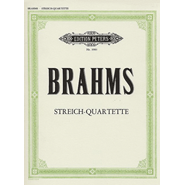 This first ever critical edition of Ravel's quartet relies not only on the Astruc edition and its proofs, corrected and altered by the composer, but also on the revised edition issued by Durand in 1910. 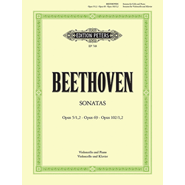 All discrepancies between the score and the later publication of the performing parts are addressed in the Critical Commentary. 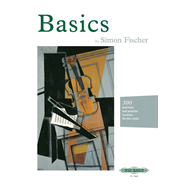 In addition to presenting scales and scale studies in all keys, this book includes a wide range of related practice material, including: exercises for finger preparation; exercises for smooth bowing; rhythm, accent and bowing patterns; a practice method to develop "fast" fingers; the turning point at the top of the scale; and exercises for shifting. 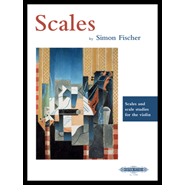 Scales and scales studies for solo violin - One of the central and original features of SCALES by Simon Fischer is that scales are built up gradually, in order to develop good intonation. 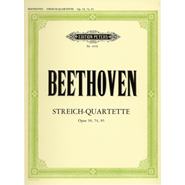 Taking this approach beyond that developed by Carl Flesch in THE ART OF VIOLIN PLAYING, each scale is also preceded by studies using the tonic, third, fifth and seventh as their basics. An extensive system of "held-down finger lines" further helps intonation and left-hand stability.